The family pet has long been the unofficial family member. While we all know we should treat our pets in such a way to establish dominance and order, it's so easy to spoil your pet and lavish it with the same level of attention as a human child. Though any dog trainer worth his salt would discourage this behavior, they would have no room for critique when it comes to transforming one of your digital images of your pet as a pop art-inspired art piece. The end result, as shown, has a look reminiscent of Warhol, but the process is purely digital. We take your digital photo, desaturate it of color, add in some effects that mimic silk screen anomalies, and finish the look by adding in vibrant fields of color. The final design is then printed on artist canvas, stretched over 1/2" non-warping foam board, and arrives ready to hang. The image can also be printed on wallpaper for a custom wall mural as well. So stop spoiling your pet and reinforcing negative behaviors, and treat yourself to a fabulous art piece that you will enjoy for years to come. 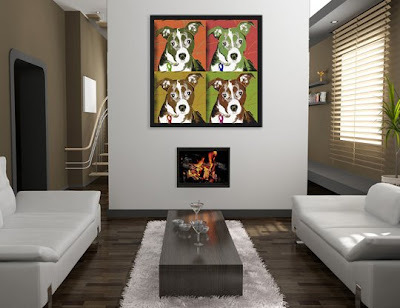 Opt for a custom wallpaper installation of your pet's pop art image for a larger than life homage to your dog, cat, bird, or whatever pet you have. Contact us today to learn more.